Rising sea level is one of the greatest threats posed by climate change. The Greenland and Antarctic ice sheets have been released at an increasing rate during the past few decades, and are the largest source of uncertainty in projections of future sea level 1 2 . How much these ice sheets will change over the coming decades to centuries, and how they will affect Earth's climate, remain largely unknown. Two studies now provide some answers to these questions. Edwards et al. 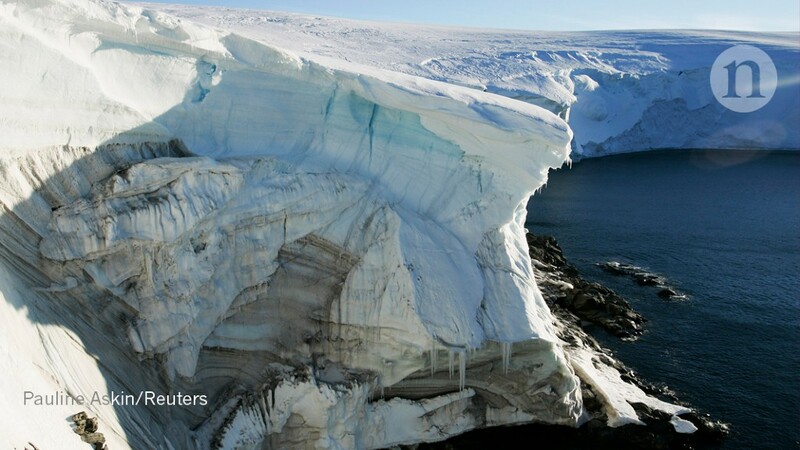 3 revisit estimates of the contribution of the Antarctic Ice Sheet to sea-level rise over the next few centuries. And Golledge et al. investigate how polar ice sheets affect other components of the climate system, demonstrating the ice sheets' crucial role in shaping ocean currents. By taking this process into account, a numerical model predicted 6 Antarctica alone could contribute as much as one meter to sea-level rise at 2100 in a 'business as usual' scenario of carbon emissions – which are small, if anything, done to abate emissions. For comparison, other models that do not include this process estimated that Antarctica could contribute less than 40 cm. 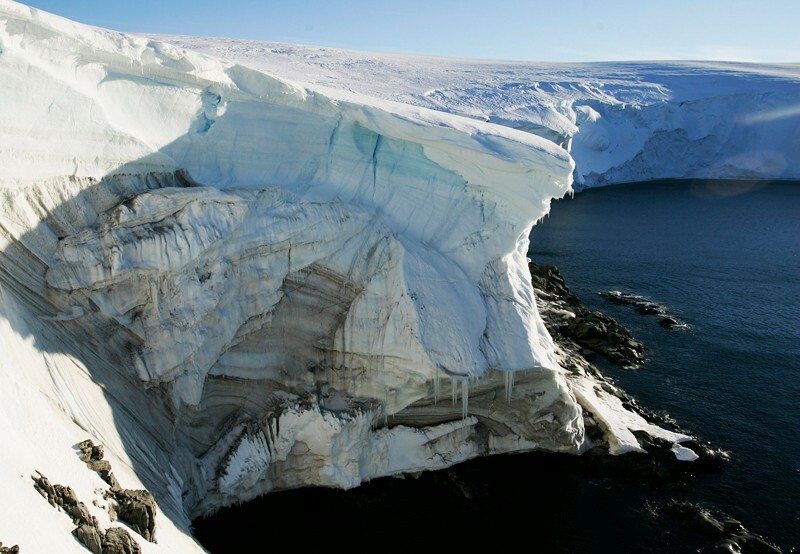 Marine ice-cliff instability was first used for reconcile models of ice-sheet flow in the Antarctic with sea-level estimates in warm periods of Earth's history 6 . However, the mechanism has been questioned by some glaciologists, partly because it has not been directly observed and is therefore difficult to model. Edwards et al. use emulators of complex ice-sheet models to run large ensembles of simulations and explore the full spectrum of model parameters. They show that, for many sets of parameters, marine ice-cluster instability is not needed to reproduce the estimated Antarctic ice loss during three past warm periods: the mid-Pliocene (about 3 million years ago), the most recent interglacial (roughly 130,000 –115,000 years ago) and 1992–2017. 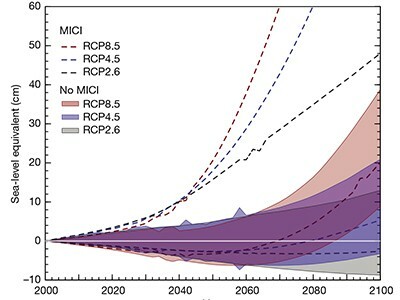 They also find that, without this mechanism, the projected contribution of Antarctic ice to sea-level rise by 2100 agrees with the results of previous work 7 – 10 : a 5% chance of more than 30–40 cm during high-emission scenarios and at 5% chance of more than 10–20 cm during low-emission scenarios. In the second study, Golledge and colleagues analyze the impact of the changing Greenland and Antarctic ice sheets on Earth's climate. Climate models typically include a dynamic atmosphere, ocean and sea ice, but do not consider changes in ice-sheet size and volume. Because ice sheets evolve on much longer times than those that govern the atmosphere, their evolution is assumed to have no effect on the other components of the climate system for simulations that cover a few centuries. As a result, ice-sheet simulations are carried out independently – with the influence of the atmosphere and oceans specified – and the impact of the ice sheets on these other components is therefore neglected. et al. investigate the validity of this approach by including changes in the release of melted ice into the oceans in a climate model. They show that the increased discharge of fresh water from the ice sheets has important consequences for ocean circulation on much shorter timescales than expected. For example, in the Northern Hemisphere, the increased amount of fresh water released by the Greenland Ice Sheet gradually slows down the Atlantic Meridional Overrun Circulation – a large system of ocean currents that brings warm water from the tropics northwards. The deceleration leads to a 15% reduction in the simulated strength of this ocean circulation system between 2050 and 2100. Meanwhile, in the Southern Hemisphere, the increased amount of fresh water released by the Antarctic Ice Sheet traps warm waters of the Southern Ocean beneath the sea surface. The trapped waters enhance the melting of floating ice shelves, leading to even greater loss from the Antarctic Ice Sheet. Including such interactions between the ice sheets and other parts of the climate system produces an increase of about 50% in the predicted amount of ice-sheet loss at 2100, as well as greater variability of global temperatures. These results show that ice sheets should be investigated and modeled as an integral part of the climate. The studies by Edwards, Golledge and their respective colleagues demonstrate that polar ice sheets will have a crucial role in Earth's climate in the future, and highlight the need to explore the two-way coupling between the ice sheets and other climate components. They therefore emphasize the limitations on the modeling of these remote ice sheets. For instance, current numerical models have a spatial resolution that cannot capture all of the outlet glaciers in the Greenland fjords. 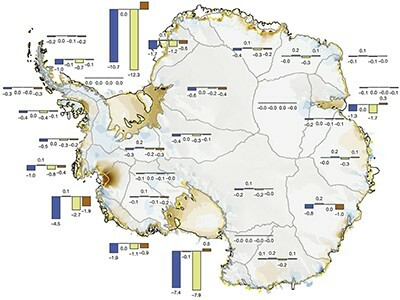 Moreover, these models cannot accurately simulate the migration of grounding lines – the transitions between grounded ice sheets and floating ice shelves – in Antarctica. As a result, the models rely on simple parameterizations to account for such effects. Further work is needed to improve numerical models and better understand how ice sheets will affect Earth's climate over the coming decades and centuries.